grass stains: Combo or sandwich only, Internet? Combo or sandwich only, Internet? 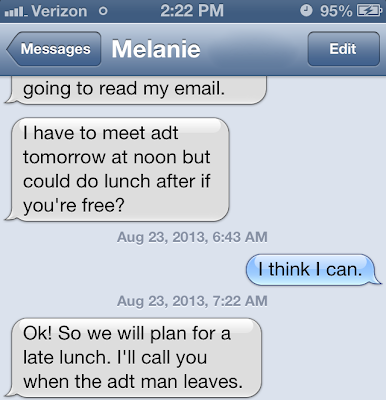 Melanie and I are having lunch together today, which reminds me of the last time we lunched together. Last week. Allow me to set the stage. 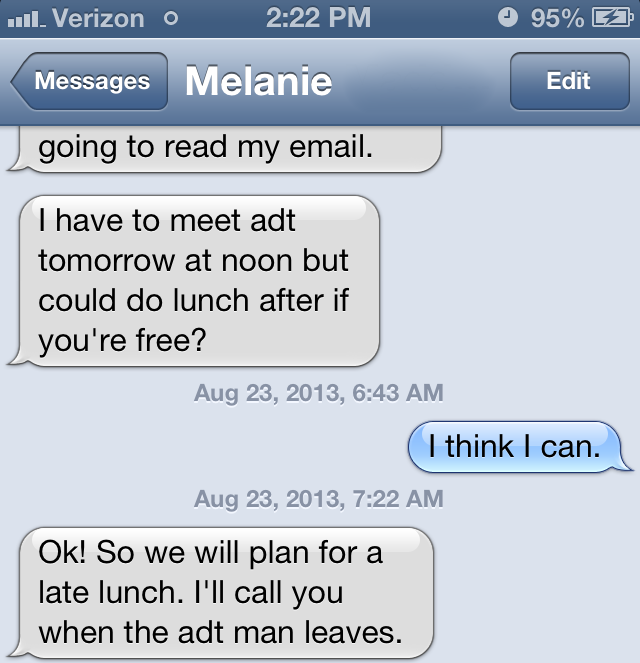 Mel texted me about grabbing lunch after her appointment with the alarm company. I responded with unrestrained glee, as is customary for me. Soon after her confirmation text, she called me on her way to work. She said something to the effect of I can't wait to see you because you're my very favorite and this will take my whole day up a notch in the satisfaction department and then she said verbatim, "I HAVE CHIPS AND STUFF AT THE HOUSE." She told me she wanted a "#1 sandwich." 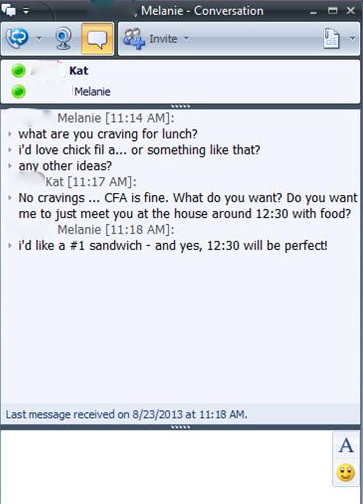 When I left for Chick-fil-A, I texted her to ask if she wanted a drink -- I didn't know if the "and stuff" she had at the house included drinks. So I ordered a (diet-mandated and not nearly as good) grilled-chicken combo for myself and a regular Chick-fil-A sandwich and a Coke for Mel, then headed to her house. Where, when I pulled everything out of the bag, she was like, "HO', WHERE MY FRIES?" And I said, "You told me you wanted a sandwich." And she was like, "Yesssss, but I said a NUMBER-ONE SANDWICH. Which is a COMBO." And I said, "No, a Number-One Combo is a Number-One Combo. A Number-One Sandwich with a Diet Coke and I Have Chips and Stuff at the House is a totally different thing." AND THEN SHE ROLLED HER EYES AT ME, INTERNET. So I gave her my fries and I ate the Baked Doritos she had at the house, which were better for my thighs and surprisingly tasty. Although not nearly as tasty as Chick-fil-A Waffle Fries. Assuming you had only the information I had -- DO NOT ASSUME YOU WOULD HAVE ASKED ANY ADDITIONAL QUESTIONS, BECAUSE THAT SHIP HAS SAILED AND I DON'T LIKE MONDAY-MORNING QUARTERBACKS-- would you have bought Mel a combo or just a drink and sandwich?